Clients continue to demand more value from their outside advisors and service providers. Corporate executives themselves are under constant pressure to deliver more for less—to increase their output and spend less doing it—and they are passing that on to you. The logical result is downward pressure on fees (despite a very robust economy), the pervasive use of procurement to buy everything, and clients’ demands for “extras” and out-of-scope deliverables that they don’t actually want to pay for. Lowering your prices is the least desirable way to add more value. That strategy often becomes a proverbial “race to the bottom” which destroys your ability to invest in your business. So here are eight strategies you should consider that can help you add more value in your relationships without spending more resources and time—and without the damaging fallout of discounting. 1. Move low-value support activities out of your organization and into your client’s organization. Most clients have an infrastructure in place to manage projects and deal with administrative tasks. What could your client take over? Examples: Scheduling, hosting meetings, printing documents, taking notes in meetings, tracking data, sending reminders to people, hosting content like videos and documents, opening up their network of contacts to you, etc. 2. 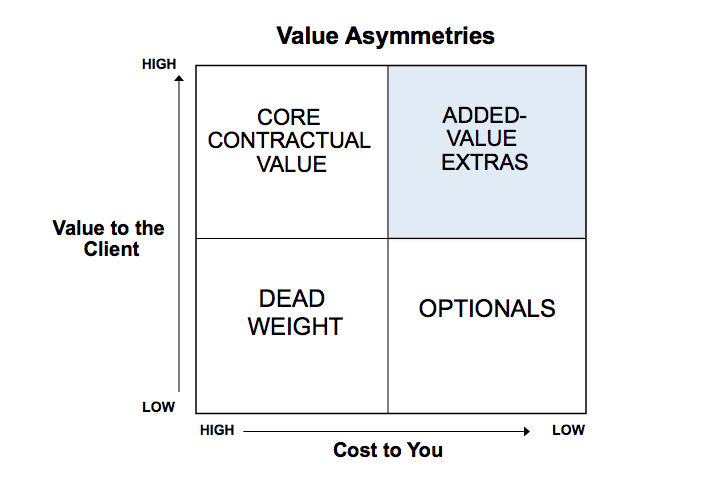 Provide extras with favorable value/cost asymmetry. There are invariably some activities, features, or deliverables that have high perceived value for your client and which cost you very little to provide. These are great things to offer as options in a proposal or even as no-charge extras when you are negotiating a contract and face discount pressure. 3. Stop writing long proposals and reports. Most executives are too busy to read 20 page proposals and 100 page reports. Sometimes—for an RFP response, for example—you do have to submit a lot of page content. But, in many cases you can dramatically synthesize and summarize. Examples: Most proposals can be boiled down to 3-4 pages. Instead of creating huge PowerPoint decks on your findings that you deliver on a forklift, develop a 10-page summary of your analysis and recommendations and invest your time designing and facilitating a workshop with the client. They’ll remember the workshop, and how it impacted their thinking, but they won’t recall most of what you wrote in the report. Documents are overrated. 4. In line with (3)… Refocus on your “live performance.” Over the last decade, sales of recorded music have declined, but ticket sales for live music events have steadily grown. Why? Humans still love a great, in-person experience. As an expert in your field, you greatest value is NOT writing a memo but rather having a vibrant, engaging, and provocative conversation with a client that helps them look at their challenges in new ways. Top executives want to have perspective-shaping conversations with you, not read long reports. Example: Instead of writing a long memo or report, go meet with your client using a one-page outline of the key issues. Instead of sending an email, call your client. 5. Move faster. Especially in businesses like professional services and IT services, the longer you take to deliver an engagement, the more expensive it becomes. The easiest way to blow your budget is to stretch delivery out way past the original deadline. Example: Plan and execute the minimum activities needed to deliver on your commitment to the client—don’t conduct superfluous or extraneous interviews and do extensive analyses that aren’t absolutely essential. Move fast. Be willing to cut to the chase more quickly with your clients and tell them what you think early on. Focus on delivering a successful project or product—not a perfect one. 6. Re-use and repurpose your core intellectual capital and intellectual property. One of the best ways to add value at little cost to you is through IP assets that you reuse. Examples: Software, analytical reports, studies, market perspectives, databases, assessments, and so on. These can also include conceptual frameworks that help clients assess and frame their most critical issues. What existing intellectual capital or intellectual property do you have that you haven’t shared with some of your clients? I’m sure you can find plenty. The problem for many of my clients, in short, is not that they don’t have any good ideas—it’s that they aren’t actively and systematically sharing the ideas they do have with their own clients! 7. Delegate, streamline, or eliminate internally-focused activities in order to free up more time with clients. Some of the executives I work with are getting 200, 300, or even 500 emails a day—and many if not most of these emails have nothing to do with clients or customers, but rather concern internal issues. Most of my clients also spend many hours a day in meetings—one study I read says managers attend an average of 61 meetings a month. And, a lot of that time is focused on internal issues. What if you could shift some of that time into value-adding activities for your clients? Example: Let’s say you are a market-facing professional who works with clients or other external stakeholders who are critical to your organization. What activities can you delegate, streamline, or eliminate in order to spend just one or two additional hours a week with clients? What if you freed up four more hours a week to spend time with your clients and think about their challenges and issues? The impact on client value could be truly significant—and at low cost to you and your organization. 8. Get other clients to add value to your clients. Your clients can learn as much from each other—more, sometimes, than they can learn from you. Okay, you’ve heard this before…but, what opportunities are you actually creating—right now, today—to build communities and connections among your clients? You don’t have to create a forum or community, either—for example, you can interview a client about a successful program they implemented and publish a blog or podcast about it; or do a webcast where you interview one of your senior clients. In summary, you can add lots of value to your clients without breaking the bank. The key is to understand what’s really important to them. Focus more of your time on those things—and less on other activities.